In the year of the earth Tiger, Jetsun Kushok Rinpoche was born as the first child of her parents. Three other children were born after her, but only she and the youngest, who became the Sakya Trizin, survived to adulthood. They shared the same teachers, took the same teachings, and made the same retreats. They also shared the loss of their siblings, parents and homeland and were very close. They were raised by Thinley Zangmo, their mother’s sister, a remarkable woman who oversaw their education, who supervised the running of the town of Sakya, and who only slept from the hours of nine to eleven in order to practice through the night in her meditation box. Jetsun Kushok Rinpoche shares this tradition of juggling practice with householder duties. She is the mother of five, although her only daughter died in infancy. Until 1998 she worked a full-time job as weaver for a high fashion designer, Zonda Nellis and part-time cleaning houses. In addition, she conducts dharma activities and saw students in the remaining waking hours, as she does today. Like her aunt, she practices through the dark hours of the night, often not sleeping at all. She has said that she is rarely tired and has never been bored or lonely. Jetsun Kushok Rinpoche was born into the Drolma Podrang, or Tara Palace of the Sakya Khon family. She began her dharma studies at the age of five, and His Holiness Sakya Trizin was born when she was six years old. According to the tradition in her family, she took novice ordination when she was “old enough to scare crows away” at the age of seven. When she was ten years old, she did her first retreat. She meditated on the form of Vajrapani known as Bhutadamara. In her eleventh year, her father, Kunga Rinchen, sent her on her first teaching assignment. She spent the fourth through the tenth Tibetan months among the nomads on the northern plains of Tibet, giving transmissions and teachings on Phowa, or transference of consciousness, as well as conducting torma offerings, performing lhasang, or incense offerings, and giving other teachings and empowerments. This was 1951, and it was here that she made one of the first of her well-known mo or divinations. There was a large monastery in the area where was giving the teachings, and this was the time of political troubles surrounding the Rading regent. The abbot of the local monastery, Kardor Rinpoche, had sided with the Rading regent and for this he had been imprisoned by the Tibetan government. An earnest and worried delegation from this monastery requested an audience with Jetsun Kushok Rinpoche and asked her to do a mo to determine when their Rinpoche would be released from prison. She made a divination with dice and recommended that the members of the monastery perform the four mandala puja of Green Tara, and recite the Twenty-One praises to Tara one hundred thousand times, that the Rinpoche will be released. In 1952, during a visit to Lhasa when the Dalai Lama recognized and confirmed her brother as the Sakya Trizin, a group of monks requested an audience with her. They thanked her sincerely and profusely, and when she inquired the reason for their thanks, having forgotten about the incident and the divination, they told her that they had followed her instructions, and that their abbot had been released the day after they had completed the one hundred thousandth recitation of the Twenty-One Praises. Her younger brother died at four years old when she was six years old. Her mother died in 1948 when Jetsun Kushok Rinpoche was nine and His Holiness two. Their younger sister died in 1951 at age eight and their father died less than a month later, during an epidemic in Sakya. This meant that the teachings that would normally be conferred by their father would have to be offered by another guru. Their aunt took them to Ngor, where they received the Lamdre Tsokshey from the great Kangsar abbot, Ngawang Lodro Shenpen Nyingpo, Dampa Rinpoche. From this time on until they fled to India they received the same teachings and did the same retreats. At the same time that she and His Holiness received the Lamdre Lobshey transmissions from the Kangsar abbots, they also received lung or scriptural transmissions for the biography of Ngorchen Kunchok Lhundrup from the Ngor abbot of the Phende house, Phende Khen Rinpoche, Ngawang Khedrup Gyatso. This was 1953. In 1954 they received the transmission of the Druptap Kuntu form the Khangsar Shabdrung, Ngawang Lodro Tenzin Nyingpo. (the Druptap Kuntu is a large collection of empowerments and sadhanas from all four classes of tantra, compiled in the 19th century by Jamyang Khyentse Wangpo and his principle student, Jamyang Loter Wangpo). When Jetsun Kushok Rinpoche was sixteen, she and His Holiness undertook the full retreat of Hevajra. Their teacher also went into retreat with them. Although they did the retreat in separate rooms, they kept contact through notes passed back and forth, and began on the same day and ended on the same day. They performed all the requisite recitations of the different Hevajra mantras, as well as the mantras of Nairatmya. They remained in this retreat for seven and a half months, and followed it with a one month retreat on Vajra Garuda, during which she recited the mantra one million, five hundred thousand times. When they had finished this retreat, Jetsun Kushok Rinpoche’s aunt requested her to do a seven-day retreat on Ling Gesar in order to develop her powers of divination by foreseeing the future in a mirror, and she completed this also. Soon after she left this retreat, in 1955, a crowd of monks from Kham arrived in Sakya, and requested the Lamdre teachings from His Holiness, who because of his own schedule was unable to accommodate them. Their aunt then urged Jetsun Kushok Rinpoche, who was then sixteen, to give the teaching herself. The Lamdre is a complete cycle which encompasses the full range of Buddhist teachings, from Hinayana through Mahayana and up to and including Vajrayana. It revolves around the central mandala or the Virupa transmission of Hevajra. Jetsun Kushok Rinpoche bestowed the short version of the Lamdre by Ngawang Chodak, as well as the lung (oral transmission) for all the various practices and ceremonies connected with the Sakya lineage. The whole teaching lasted around three months. Thus she became the third woman in Sakya history to have transmitted the Lamdre, and in 1956 when she and His Holiness went to Lhasa to receive the middle-length teaching on the Lam Rim from the Dalai Lama, she headed the procession, crowned with the Sakya hat worn only by high Sakya lineage holders who are authorised to give Lamdre, and proceeded by a golden umbrella. It was also in 1956 that she and His Holiness received the full Nyingma transmissions of Long Chen Nying Tik from Jamyang Khyentse Chokyi Lodro, who was in Lhasa at that time. Jamyang Khyentse Chokyi Lodro came to Sakya later that year to give them the Chak Mey Nam Shi, or the Four Unbreakable Practices, which those who have received the full Lamdre teachings are supposed to practice on a daily basis. In early 1957, Jetsun Kushok Rinpoche, her brother, and entourage went to India on a pilgrimage at the same time as the Dalai Lama and Panchen Lama went to India. It was here that she fist conceived the idea of learning English in a Western-style school, but her tutor opposed such idea. In 1958, her brother’s enthronement ceremony was officially held at Sakya. Several months after that, after the loss of Tibet to the Communist Chinese, Jetsun Kushok Rinpoche, His Holiness, their aunt, and a handful of attendants fled to India. In India, Jetsun Kushok Rinpoche describes herself as being quite a tomboy. She studied the Nang Sum (the three visions) and the Dom Sum Rabye (the vows of Hinayana, Mahayana and Vajrayana) by Sakya Pandita. However, it became increasingly difficult for her to live with the outer discipline of a nun in India without the support of monastic life. She found herself the object of ridicule and scorn because of her shaved head and robes, and after consulting the Dalai Lama and her brother, decided to give back her robes, although she continued in the inner deportment of a nun. She began taking English lessons from a Christian missionary, and there met Luding Sey Kushok, who was the brother of Ngor Luding Khenchen Rinpoche. Since the Luding succession is a blood lineage, and the Luding family was an offshoot of the Sakya Khon family, her aunt and several older family attendants conceived of the plan that she should marry Sey Kushok. While she refused at first, she was convinced at last, since a male child of their union was needed to become the Luding Shabdrung, who will eventually assumes responsibilities of a Khenpo. She was married to Sey Kushok Rinchen Luding in 1964. Their third child, a son born in 1967, was different from the others. Jetsun Kushok Rinpoche observed that he didn’t cry like the other children and that he would wake up and amuse himself by making mudras with his hands and mumbling to himself as though he were reciting texts. When he was three or four, he showed real interest in becoming a monk and took delight in being around ordained people. When there were religious ceremonies he would far prefer attending them than playing with other children. This was the child that became the Luding Shabdrung. Leaving the four-year-old Shabdrung Rinpoche behind in the care of his uncles, Jetsun Kushok Rinpoche went with her husband and three young sons to Canada and settled on a farm as labourers in Taber, Alberta in 1971. In 1973 they came to Vancouver, British Columbia. They now live in Richmond, a suburb of Vancouver. At first she did not teach at all, needing to care for her young family and earn a living. 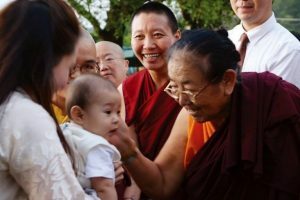 However, when His Holiness and Dezhung Rinpoche began teaching in New York, they were repeatedly asked about authentic, living, women lineage holders. They both requested her to begin teaching again. Since then she has founded a dharma centre in Vancouver, Sakya Thubten Tsechen Ling, one centre in Oakland, California, Sakya Dechen Ling and a centre in Frankfurt, Sakya Kalden Ling. She visits the Sakya centres around the world, from United States to Europe, Asia and Australia.